Review: The story of a young girl who can only express herself through famous vintage songs. She finds herself noticed by a sleazy talent agent. Meanwhile she meets a kind but nervous man who becomes her best friend. This is based on Jim Cartwright’s play The Rise and Fall of Little Voice, which premiered in 1992 at the National Theatre in London. A brilliant drama staring Ewan McGregor and Michael Caine. 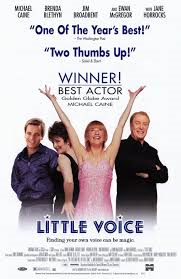 Jane Horrocks is fabulous in this and gives a performance of a lifetime. All the way through this film she actually sang all her own songs. At the Golden Globe Awards in 1999 won for Best Performance by an Actor in a Motion Picture – Comedy or Musical.